From the 1st January 2017 Gullane will only accept the Green Fee 2 for 1 vouchers on Mondays, Tuesday and Wednesdays on Courses No. 2 and No. 3. Description: Gullane No.2 Course was built in 1898 and the first and last holes of the course are on the east side of the A198 road. The Course runs alongside No.1 for the first seven holes and then sweeps down to the nature reserve next to Aberlady Bay, before turning back towards the Visitors' Clubhouse. One feature of the Course is its excellent short holes, particularly the 11th with its magnificent view and tricky club selection. 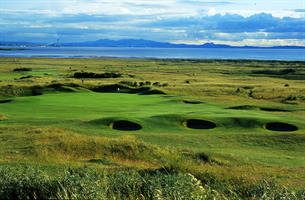 Gullane No.3 Course was completed in 1910, with the first three and last three holes on the east side of the A198 road. The remaining holes are on the South side of Gullane Hill with excellent views across Aberlady Bay to Edinburgh and the Firth of Forth. Do not be misled by the official yardage. This course will test even the most experienced golfer's ability at accurate shot making and truly is a gem. Played both no 2 and no 3 under the voucher scheme. Excellent value (cost was about £40 for the two rounds). The greens were very impressive. I played them at the end of March 2012 and they were excellent. The clubhouse was friendly with good food. This makes a great 36 hole golf day.